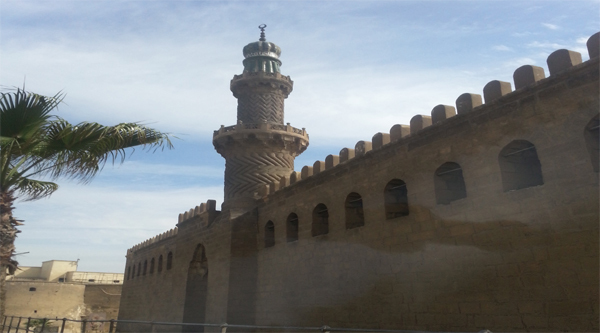 The mosque (N33) – 1125/519 – was originally at the northeast corner of the great eastern Fatimid palace. Al-Aqmar – the moonlit – was built by al-Ma’mun al-Bata’ihi, grand wazir to the caliph al-amir from 1121 to 1125, during a time of great political and spiritual crisis for the Fatimid regime. 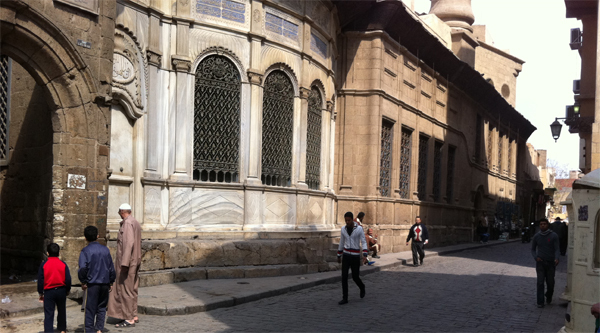 It is one of the seminal monuments in Cairo’s architectural history. 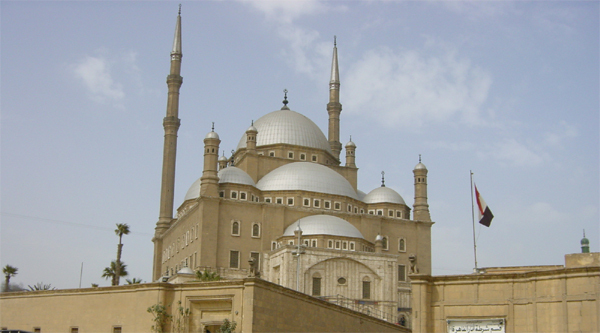 It was the 1st mosque in Cairo in which the entrance is not on an axis with the qibla wall, that is, the façade follows the alignment of the street, while the qibla wall is oriented toward Mecca. This is the first example of a ground plan being adjusted to the existing street plan of Cairo, a phenomenon that was to become increasingly common and complex in the ensuing centuries. 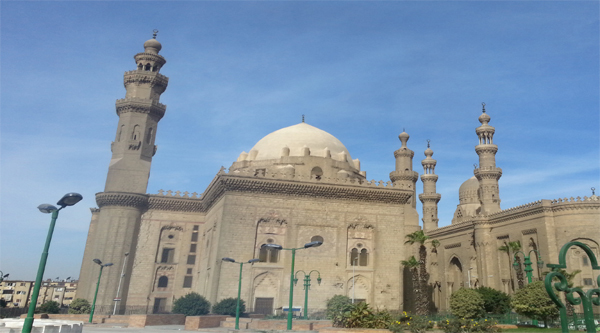 It was also the 1st mosque in Cairo to have a decorated stone façade. 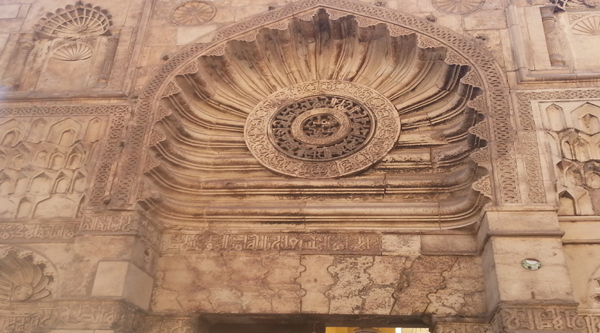 The emerging sculptural richness of Fatimid stone carving can be seen at its best on the façade of this small mosque. This façade is an architectural masterpiece. Its right-hand flank was until recently obliterated by neighbouring buildings, but it has now been reconstructed and the mosque’s original symmetry restored. The main compositional feature of the façade is its strong, vertical, tripartite division formed by three keel-arched niches. The taller, deeper niche at the centre of the projecting portal has a fluted hood with a medallion at the centre. The flutes are deeply cut, forming strong horizontal ribs at the bottom which gradually rise and radiate into a sunrise surrounding the central medallion. They terminate at the scalloped edge of the keel-arch where they are framed with finely inscribed interlacing circles. The medallion, with its delicately fretted stonework, is one of the most refined and beautifully balanced motifs in Fatimid art. It consists of a series of concentric rings composed of alternating bands of calligraphy and scrollwork. At the centre is a deeply drilled cats-cradle of Kufic repeating the name of Ali wreathed with a circle of scrollwork. The next circular band contains a repetition of Muhammad’s name, which in turn is framed and circumscribed with a broad banded, richly carved foliate scroll. The same combination of medallion and fluted hood is repeated less elaborately in the flanking niches of the façade, and this device becomes a feature of later Fatimid buildings such as the mashhad of Sayyida Ruqayya (1133) and the mosque of al-Salih Tala’i (1160). Another innovation can be seen at the top of the tall square-headed recessed panels on either side of the entrance, where muqarnas appear for the first time in Egyptian architecture as decoration on a flat surface. Above these panels the portal is further elaborated with shallow blind niches with scalloped arches springing from flanking colonnettes. A band of foliated Kufic forms the cornice of the façade and a similar, narrower band draws a horizontal line across it on a level with the springing of the keel-arches. Circular medallions have now been restored above the apexes of the flanking niches, and in shallower relief the façade is punctuated with smaller decorative panels and lozenges variously decorated with vases and interlace. Altogether, this is a beautifully proportioned and sculptured façade, in which the surface decoration and various strata of relief are chiselled, drilled, hollowed and moulded to exploit the contrasting play of sunlight and shadow. The level of the street over the centuries has risen dramatically, which is why one must descend stairs to enter the building. The al-Aqmar mosque is a masjid (neighbourhood mosque) rather than a gami (congregational mosque), the earliest surviving example of this type. It has a bent plan because the axis of al-Mu’izz street does not align with Mecca. The façade masks a structure, wedge-shaped in plan, incorporating a barrel-vaulted entrance, a small space to the right and a room and staircase on the left. The square sahn is surrounded on three sides by single-aisled keel-arched riwaqs, and the small prayer hall is three aisles deep. 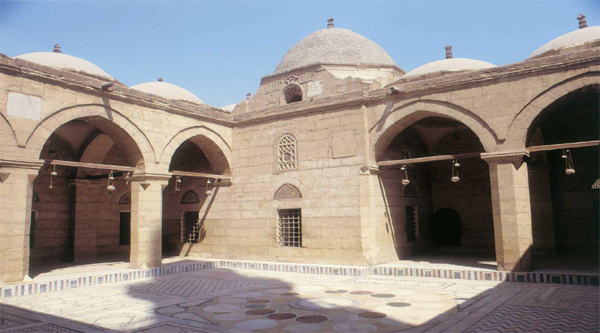 The bays of the riwaqs and prayer hall are covered by shallow brick domes except for the transverse qibla aisle which has a flat timber roof. It is assumed that these brick domes form a part of later restoration work carried out by the Mamluk Amir Yalbugha al-Salimi in 1397, because they resemble domes in the khanqah of Sultan Faraj ibn Barquq of similar date (1400–11), and no such domes are known during the Fatimid period. The interior is original, and bands of Quranic verse in Kufic script on an arabesque background still survive around the keel arches of the courtyard. Restorations to the mihrab, minbar and ablution area were made by Amir Yalbugha al-Salimi, the dawadar to Sultan Barquq, in 1393. The stump of the minaret is from a later date. In 1993, the mosque was given a total and inventive restoration by the Bohras. One of the few Fatimid structures to have survived the centuries more or less intact, the Mosque of al-Aqmar now has new inscriptions, new windows, and new marble in the sanctuary area and has thus lost its historic authenticity.